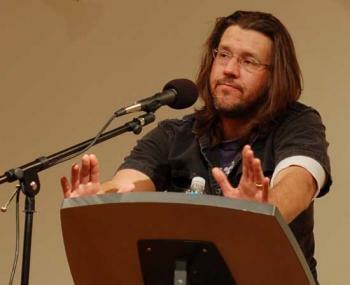 David Foster Wallace (February 21, 1962  September 12, 2008) was an American writer and essayist of The '90s and the 2000s. Technically, he began writing in The '80s; but he was in grad school at the time, so it doesn't count. Wallace was known for his unique brand of literature, characterized by long, rambling sentences, subtle irony, and complete incomprehensibility. His nonfiction is more accessible, but still full of epically long sentences and footnotes. Within literary circles, he is most famous for his second novel, Infinite Jest, which is about a videotape that is so absorbing that anyone who sees it loses interest in sleep or food and eventually dies. His group of short stories all going by the title "Brief Interviews with Hideous Men" (four of which appear in his short story collection Brief Interviews With Hideous Men along with a bunch of other, unrelated stories) was adapted in 2008 by Jon Krasinski (aka Jim from The Office) in his first foray into directing. Unfortunately, Wallace never saw it. After a long battle with severe depression, he committed suicide by hanging on September 12, 2008 at the age of 46. Between Dead Artists Are Better and the fact that he wrote some of the most experimental fiction of his time, Wallace will, with Jonathan Franzen (a good friend and frequent correspondent of his and a common if controversial source of information on Wallace himself), likely be remembered as the premier American Lit Fic writer of the '90s and '00s, and (most likely) of Generation X more generally (with Dave Eggers and Chuck Palahniuk coming in a distant third). A Supposedly Fun Thing I'll Never Do Again (1997, essay collection). The "supposedly fun thing" is a seven-night cruise in the Caribbean. After reading the essay, you will either (a) never want to ever take a cruise or (b) want to take a cruise and document exactly the kinds of suffering that DFW did. Incidentally, the ship he sailed on warrants an article on The Other Wiki. Make of that what you will. Doorstopper: His most famous work, the novel Infinite Jest, is about 1100 pages. The Pale King is 960 pages long and incomplete. Exactly What It Says on the Tin: Brief Interviews with Hideous Men. Footnote Fever: His favorite technique. His footnotes frequently take up most of an entire page, especially in his nonfiction. The method apparently developed when he was writing Infinite Jest, where he needed to break up the narrative, but not too much. He chose the method of using endnotes, which developed into footnotes in his later works. The endnotes for Infinite Jest fill up over one hundred pages, the length of some novels. At least one of the footnotes in Infinite Jest exceeds 7,000 words long, making that one footnote as long as your average novella. Unintentional Period Piece/Zeerust: Most of his work can be pretty definitely placed in The '90s. Even Infinite Jest, which was supposed to take place 20 Minutes into the Future (probably around the new tens), manages to have this going.